Not sure if you want to take the plunge required for full Scuba certification? This class is a great way to get your feet wet, and find out! 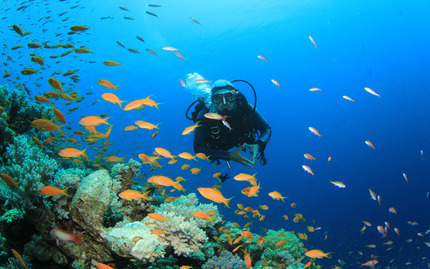 You'll suit up in professional SCUBA gear, and work with professional divers in an indoor saline pool. This is a great way to get introduced to the essentials of Scuba diving, and gain confidence under water. You'll learn about the gear you'll be using to dive, find out what it's like to breathe under water, pick up some key skills, and find out what it takes to earn a certification. All in all, it's sure to be breath of fresh air. Note: This course requires purchase of the DSD Participant Guide, available in the diving facility's shop. You must be at least 10 years old and in reasonably good health. No prior Scuba Diving experience is required.